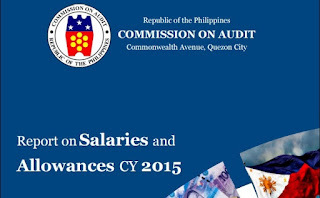 A report by the Commission on Audit (COA) showed that the top 10 highest paid government officials in the country were paid a grand total of close to P100 million. The COA report covered 8,311 government officials from 957 government agencies but excluded elected officials from the President down to local government officials. The top earners were the top honchos of government-owned and controlled corporations (GOCCs) and financial institutions. 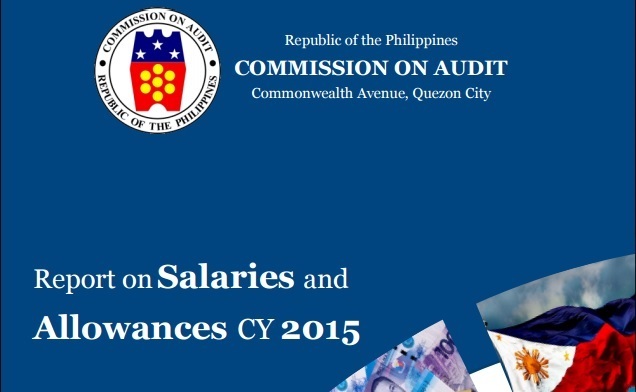 The highest paid among all officials included in the report was Bangko Sentral ng Pilipinas (BSP) Governor Amando M. Tetangco Jr., who earned a total of P13.957 million in 2015. Tetangco was followed closely by GSIS President and General Manager, Robert Vergara, who had total earnings of P13.449 million. In third place was Securities and Exchange Commission (SEC) Chairman Teresita Herbosa with total earnings of P9.368 million. Rounding out the top five were Anthony Robles, the Vice President of Development Bank of the Philippines (DBP) and BSP Deputy Governor, Nestor Espenilla. Broken down to their monthly gross earnings, Tetangco earned an average of P1.163 million a month, while Fe Prado, the DBP Head of Financial Resource Sector who ranked 10th on the list, earned an average of P704,258 per month. Though the salaries may seem too much at first glance, it should be noted that CEOs of top corporations in the Philippines earn at least three times as much as the top officials of the government. Now we understand why President Rodrigo Duterte himself said in one of his press conferences, that he is finding it hard to get qualified individuals from the private sector to work for the government. When it comes to top executives, the total compensation offered by the government is way below that of the private sector.